Mallory Stewart is a nonresident fellow in the WMD, Nonproliferation, and Security program at the Stimson Center. Her areas of expertise include chemical and biological weapons law and policy, space security policy, U.S. missile defense, and nonproliferation and arms control law. 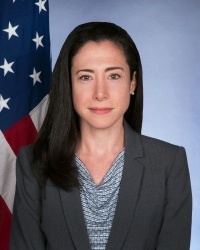 Prior to joining Stimson, Stewart was the Deputy Assistant Secretary of State for Emerging Security Challenges and Defense Policy in the Bureau of Arms Control, Verification, and Compliance (AVC) at the U.S. Department of State. In that role, she was responsible for overseeing the Office of Emerging Security Challenges and the Office of Chemical and Biological Weapons Affairs. Stewart joined the State Department in 2002 as an attorney in the Legal Adviser's Office. In 2014, Stewart was a recipient of the Secretary' of State’s Award for Excellence in International Security Affairs for her work on the international effort to eliminate Syrian chemical weapons. Ms. Stewart was a litigation associate at the law firm of Sullivan & Cromwell prior to joining the State Department. She holds an A.B. from Harvard College and a J.D. from Stanford Law School. Common Challenges to Diverse Security Threats: A Conversation with Mallory Stewart ASIL's Nonproliferation, Arms Control & Disarmament Interest Group & the Dean Rusk International Law Center.